Please refer to our stock # J152 when inquiring. 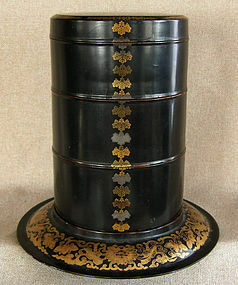 This rare Edo period antique Japanese round box has 3 tiers, lid and plate. There is a column of small Gosan kiri family crests down one side and another column of small family crests on the other side. The inside is of each piece is red orange lacquer. The box fits into the rim of a plate which was use for serving. The gold lacquer paintings designs are all very fine. The box on the plate stands approx 9.5 inches tall. and is approx 5.5 inches in diameter. The plate is 9 inches in diameter. Mid 19th century.